Established in 2013, Northern Monk operates between two sites in Leeds. Focussing on creating the best beer experiences in the world, the independent brewery moved into Holbeck’s Old Flax Store site (a Grade II-listed mill) at the end of 2014: home to the brewery, The Refectory tap room and Chapter Hall event space. To meet demand, Northern Monk expanded into a Sydenham Road site in 2017, housing a much larger brewery, warehouse and storage facility. Here, a 12-fill head, 6,000 can per-hour Monoblock rotary canning machine was installed in 2018 following a remarkably successful equity crowdfunding campaign where the brewery surpassed its £500,000 target in just three hours. The funding closed with a total of £1.5 million raised through 2,161 investors. Alongside allowing Northern Monk to triple capacity, the brewery also opened their second tap room in the heart of Manchester’s Northern Quarter. Now exported to 23 countries, Northern Monk is one of the North’s fastest growing drinks companies. Moreover, community and collaboration are at the core of Northern Monk’s business, with a prominent focus on working with people that share their passion and values. They regularly collaborate with national and international breweries, businesses and charities, striving to help strengthen the North for positive change. 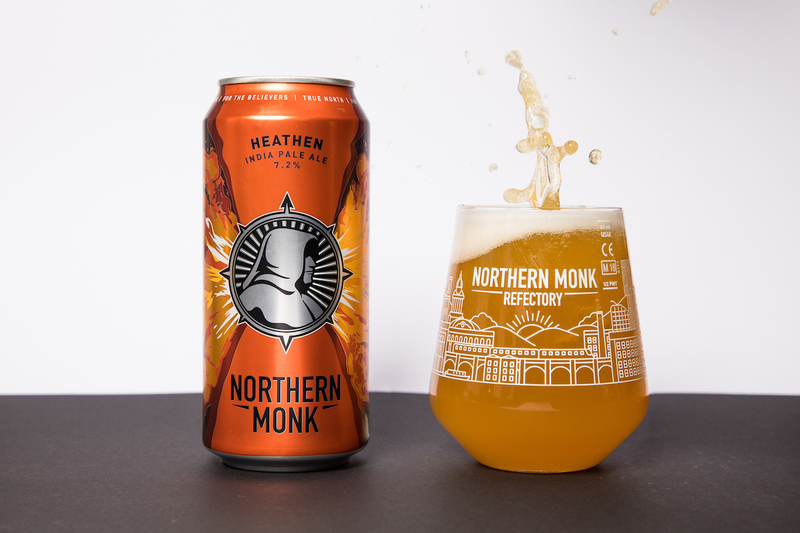 Inspired by their Northern surroundings and the history of monastic brewing practiced across the region for thousands of years, Northern Monk’s Heathen is a big, bold New England IPA with an ABV of 7.2 per cent. On pour, the beer is hazy yellow, capped with a creamy white head. Bold citrus notes are initially prominent on the nose, joined by floral hop aromas, pine, tropical fruits and some dank notes. Citrus’ presence continues on the palate alongside a whisper of mango, pineapple, peach and grape in harmony with resinous pine and some caramel and biscuit malt savours which open up for a soft bitterness which lingers on the dry finish. An exceptionally juicy NEIPA with an oily texture, lively carbonation and well-integrated alcohol. Further information on Northern Monk can be found here.